I think I like that. so - worlds are looking super interesting this year. who is going to have the best team? Belguim not nearly as strong as the usual Belgian teams. They dont seem to have a major climber ... but they do have lots of puncheur types who will be itching to get away. GVA won the Olympic RR which was pretty hard after all. And on http://www.uci.ch/road/ranking/, Colombia sit in a fairly comfortable 7th with 8100 points; 11th placed Slovenia are on 5200, so would need pretty much the entire top 10 in both San Seb and Poland to overhaul them by the August 12th deadline. For Belgium, you'd have to think this is a climb too far for Greg, but we all thought that before Rio too. They have so many puncheurs who can sort of climb but aren't going to fancy winning from the group of favourites - De Gendt, Wellems, Benoot, Hermans, Pauwels. Very interesting to see what they come with. I think the Yateses are an interesting shout for GB and, if he fancies it, Thomas's displays of power sprinting for mountain stages show that he could be a contender. It'll be the first time in a long time that we have a decent shout at a lumpy Worlds. Poland, with Majka and Kwiat, are a bit of a dark horse team. Denmark are a bit similar to Belgium, lots of nearlys but no standout. That Colombia team are kinda terrifying, Spain likewise. France with Bardet and Pinot have two strong racers with unfinished business this year. Netherlands also gonna bring a lethal team to this one - Tom to pull off the triple crown of runners up spots? Top pick for me has to be Vincenzo - he knows this is his last best chance, and after his Tour crash he'll be putting everything on the line for this. Went so strong at Rio too before that crash. A number of really strong teams. In addition to those AG mentioned, don't forget the Brits: Yates x2, Thomas, Froome. The Yates brothers and Thomas all have a more than decent kick at the end of a hard ride. The Polish double-act of Kwiatkowski and Majka will also be dangerous. But in sheer numbers of top climbers, hard to beat the Colombians - although they lack a single, clear leader. Personally, I am quite excited for the Dutch here. I hope Dumoulin can get back into shape after the Giro-Tour double madness, he'd be the favourite for the TT and has an outside shot at winning the road race. The Dutch team does lack a killing edge - as Dutch riders generally do. None of the climbers have anything resembling a sprint finish. Maybe Poels, probably our best bet as leader, but otherwise we'll have to rely on long-distance attacks. Nibali should be the favourite if he's in top shape. He has shown he knows how to peak late in the season, his Lombardia wins are evidence of that. 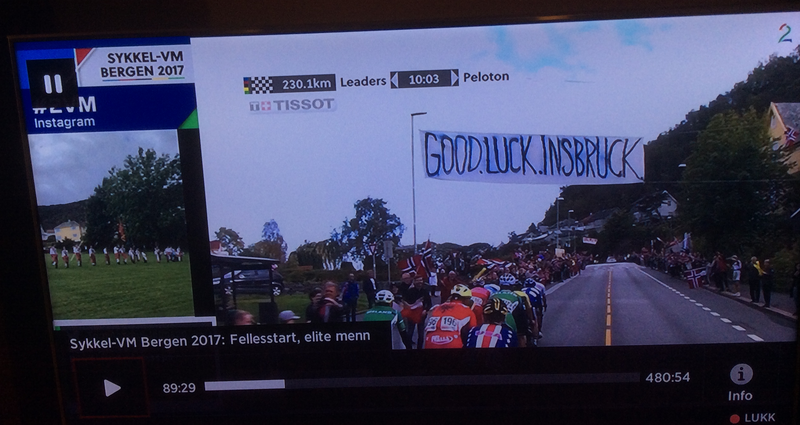 Plenty of strong supporting riders for Italy too. But despite my support for the Dutch and Nibali... just how cool would Dan Martin in rainbows be? Austria is currently 19th, ~220 points ahead of & ~270 ahead of - but as host nation, they're guaranteed six places anyway. I hope it will be as fun as we had it, and that it doesn't become an economical disaster for town and cycling community. The hangover has been so bad it aches to write about it, but it was quite a party, too. I forgot about Roglic. Seriously. That's how little I cared about the Tour this year. Mohoric's biggest results were after the 12 August deadline, so they don't count (for this year's Worlds). I might put money on Mohorics greatest results this year coming towards the end of september. He is so insanely fast downhill he can actually win the rainbows. He might benefit from the teams of other not-so-fast-climbers-but-great-classics riders like Belgium (van Avermaet) and Slovakia (Sagan), Poland (Kwiatkowski) but may struggle to contain the really fast climbers like *fra Alaphilippe Valverde or find himself outsmarted by the shark - but he can also just simply win it. Dumoulin, Kelderman and Van Baarle for the TT. Brand, Van Der Breggen, Van Dijk and Van Vleuten for the TT. I definitely see the possibility of a Dutch double in the elite ITTs. And I see five possible RR winners out of the eight women selected: Van Vleuten, Van der Breggen, Brand, Blaak, and Stultiens. However, I don't really see a likely winner for the men's squad. The best bet, in my opinion, would be Poels, not Dumoulin. Like Froome, Dumoulin is a stage racer. He may have the power required to win this Worlds - but a one-day race needs tactical nous, and of a different sort than stage racing. Either of those will have to crest the last climb (the ultrasteep Hölle) alone with a significant time gap because there are so many that descend faster than them, even among the good climbers: we know how Froome alone fared against Dumoulin and some friends. Poels would be the captain, we haven't seen him climbing crazy fast on steep classics climbs, but remember his inside turns on the Angliru last year? Add to this the fact that he has won the L-B-L, so he is a proven monuments man. Looking at Team Sky in the Tour of Britain yesterday, it actually seems like his British teammates will not challenge him for the win? Sosa is riding the U23 event. Sosa is riding winning the U23 event. Uh, yah. Wonder who'll they'll vote in as leader. It's almost too easy to predict they'll spend more time watching each other than winning. I dare them to prove me wrong. Double dare. If healthy, Jairlinson Pantano is better than a lot of those listed here on such a course and would have been a second choice for captain. Uran ... doesn't look his best even though he certainly tries. What I am getting at is ... it is only Henao that is fast enough on a crazy steep climb to win if the field comes reasonably compact in to the last climb, and the new three musketeers can only win it by going early (on the other climb) and getting a gap. I certainly wouldn't bother having Quintana there. That's the equivalent of picking Froome/Porte. Great climber in stage races = climber in one dayers. Sosa would be an obvious selection instead, but you can understand them targeting the lower fruit with him. As for a captain, I would lean towards Uran, but both him and Sergio would be protected and I'd leave it till the day and probably the last lap to see who was feeling better etc. Owww. Things must be pretty serious then!
. . . and I'd leave it till the day and probably the last lap to see who was feeling better etc. Oh, yah, I'm sure that's exactly the sort of planning they'll do. No doubt in my mind. To be fair. Henao and Uran seem to be able to think ahead a bit more than the rest. If there is any sort of consensus that either of those two should be the protected ones, they might stand a chance. And I can see going for two protected riders. Rosskopf and TJ will ride the TT. A point of order that maybe Fus can answer, Tom Wirtgen is down to ride the U23 TT along with the Elite RR, surely he can't mix and match his categories like this? I didn't know Didier Laurent rides for Luxembourg. Colombia should ride for Uran. Leadbelly: That Road to Innsbruck with Flecha is great. Thx! Leadbelly...I agree with MGee, Flecha is a great presenter! Do you also have a presentation of the main lap ?